The Universal Sun Shade II is our sun shade of choice for warm, sunny days. With the ability to wear 8 different ways, this shade is extremely versatile and perfect for fishing, kayaking, and many other outdoor activities. This shade is breathable and quick-drying for comfort. Add this 50+UPF shade to any hat or pair of sunglasses you own and head out to the lake. Each of our sun products is created to extend your outdoor experience. 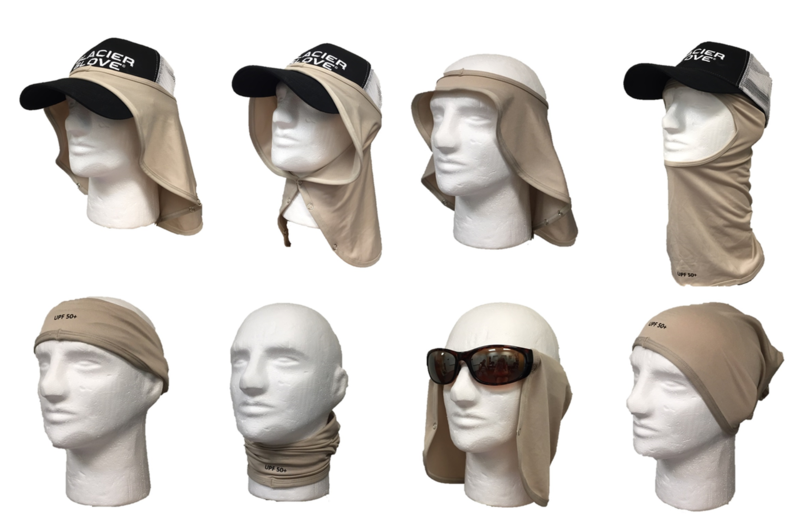 Simply place the Universal Shade II over, or under ANY existing ball cap, visor, hard hat, etc to convert them into a sun hat. There is no more need to invest in expensive “flap” sun hats. Take the Universal Shade II on and off with ease whenever desired. This first of its kind application, truly sets the Universal Shade II apart from competitors. By folding the Universal Shade II top to bottom and engaging the top 2 snaps, you are able slide any eyewear stem through the passageway for an instant, neck and ear, shade attachment. This patent pending design allows the wearer to apply the shade to his or her glasses without removing any existing eyeglass retainer. For those who don’t wear a cap…this is the answer. This is Universal Shade II answer to the very popular “mask” type sun tube headwear. By folding the Universal Shade II left to right and engaging all 3 sets of snaps, the Universal Shade II then slides over your head as any other “tube” would. Your eyes will appear through the head hole portion. With the lightweight, 4 way stretch material, you’ll find the comfort and breathability surpasses the competitor. From the above mask position, or anytime the Universal Shade II is snapped fully left to right, simply slide the entire Universal Shade II down to your neck area. This will cause the mullet fabric to loosen and scrunch up as other “tube” type headwear does. Leaving the shade in this position will protect the front and rear of the neck, yet remains easily accessible to slide up onto your face for more protection if desired. From the mask position, simply grab the bottom portion of the Universal Shade II, and pull up towards the top of your head, doubling over the Universal Shade II fabric that is engaged with your forehead. This use provides little sun protection, but is great for working out, biking, or any general activity. With the Universal Shade II comfortably on your head or hat, you have the option to snap one of the snap sets under your chin to secure it in windy conditions. This is a simple solution to a common “flap” hat problem. For simple outdoor activities or as a fashion statement “scrunch” the shade to a desired width and wear as a headband.